pulau | eat. drink. cook. travel. 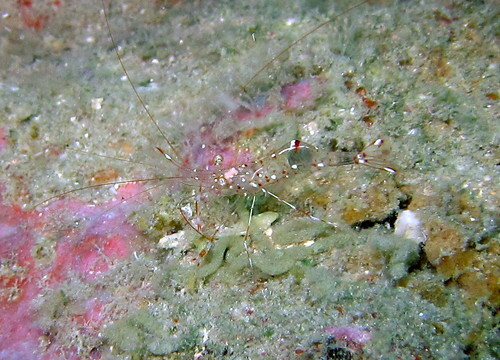 We didn’t have great visibility for most dives and the colours weren’t very good at all. Low visibility tends to tinge everything green. 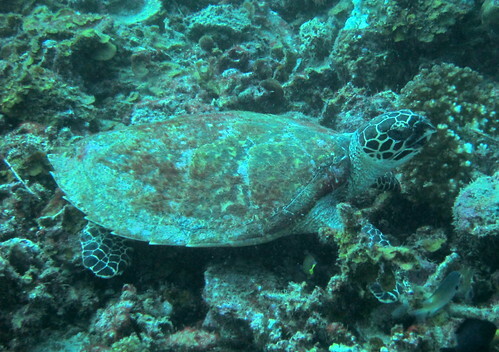 Still, we managed to see some interesting creatures, like this green turtle poking around in the coral. 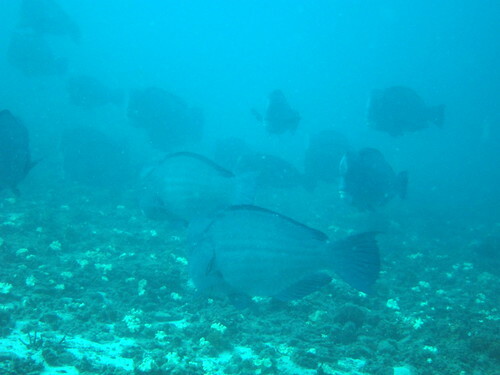 One morning, we were treated to a herd of bumphead parrotfish on their morning breakfast foray. This big guy came right up to us to check if we were chompable enough. He soon realised that we weren’t yummy coral and joined the rest of his herd. And off they sailed, back into the murky water in search of their breakfast. 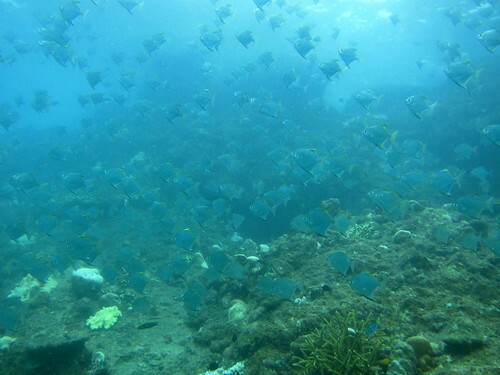 One thing that astounded me this trip was the first time I saw pomfret underwater, and in large schools no less. 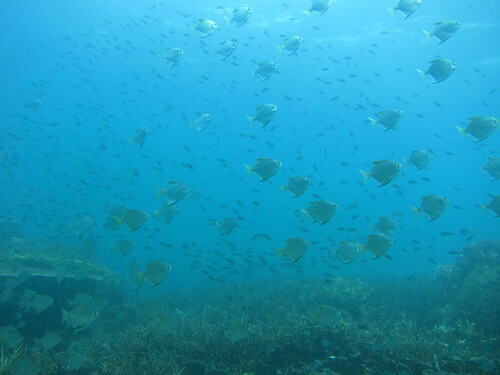 We were minding our own business doing the usual reef tour and suddenly we came up to an alcove of sorts and found them schooling in the thousands. It was an incredible sight. I must confess that I was trying to figure out whether they were the white or silver pomfret and whether we could catch any for dinner. We stayed there for ages simply gawking at the sight of so many fish in the same area, marvelling that there was enough oxygen in the water to keep them going. 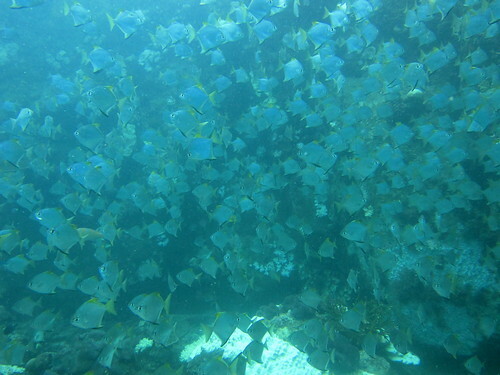 My fish ID book calls them diamondfish, and the tend to school in shallow waters close to silty areas. What a bonus for diving in a low visibility period. 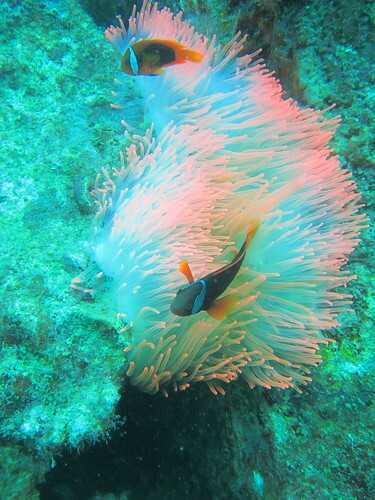 As always on a dive trip, I’m fascinated by the vividly coloured anemones and their impossibly cute fish. I never get tired of taking photos of them. 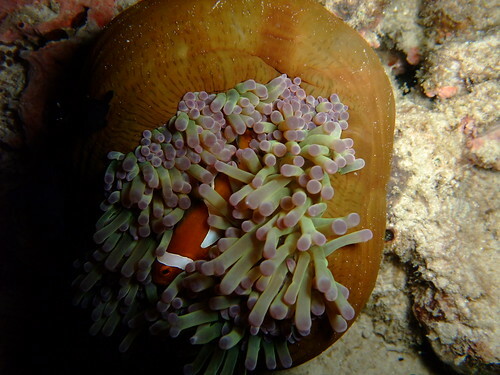 This time at Redang, some of the anemones were also affected by the bleaching and there were some very unusual colours. This green and blue anemone wasn’t so badly affected as it’s pretty close to the usual green and purple. 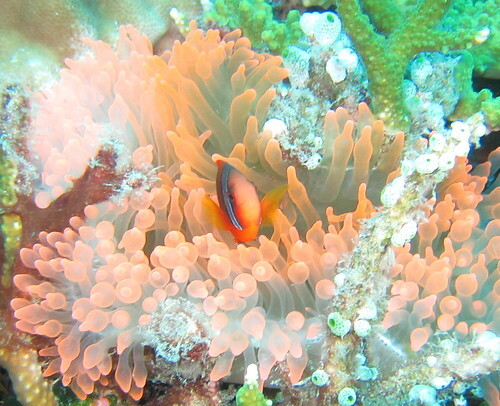 It made for a beautiful contrast with the bright orange clownfish! Less normal was this bleached out specimen, though the white and pastel purple-blue was so pretty. 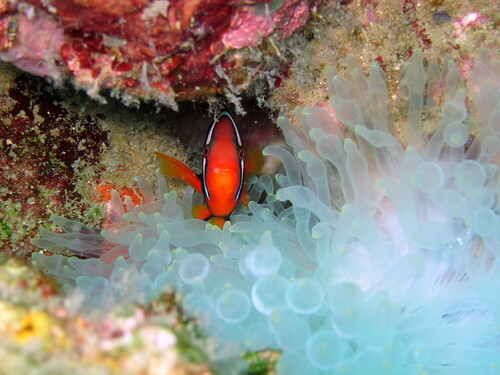 Equally pretty was the baby anemonefish taking shelter here. We then got down to even more bleached anemone, with this little fella both wary and curious of the intruder with the lens. 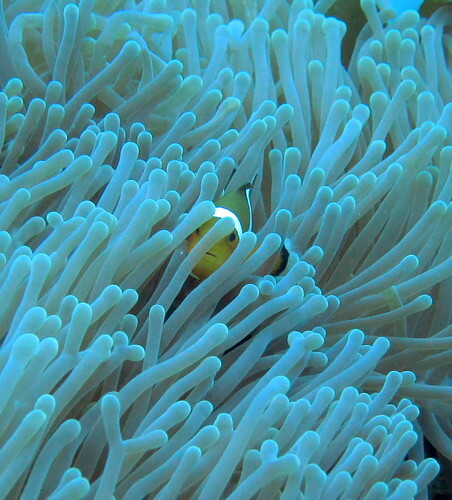 The worst bits of bleaching hit the panda clownfish. Check out this poor shellshocked fish. My heart goes out to him. 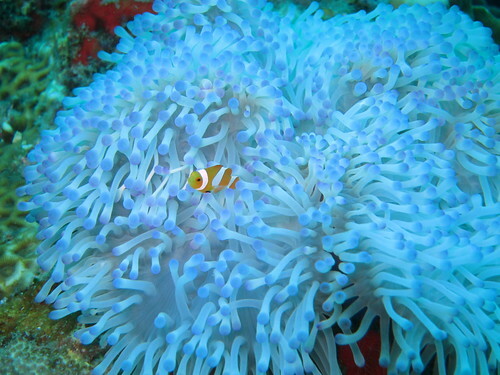 This anemone is not normally white or even pretty fluorescent orange, it’s usually a dark orangey-brown, quite similar in colour to the pandas themselves. 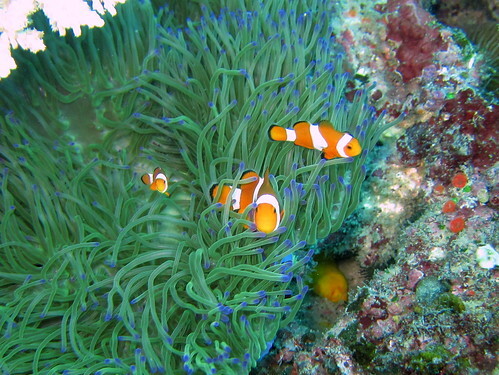 It was really sad how they sat glumly in their bleached homes, not being able to change anemone because they were evolved to only live in one type. 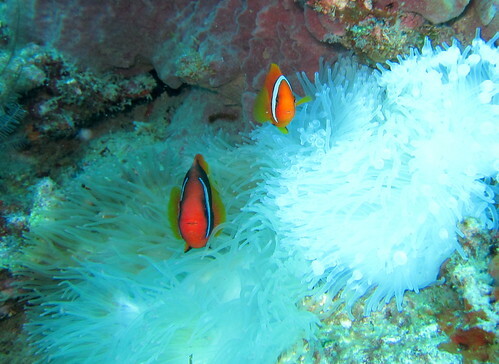 I hope the bleaching has stopped and the anemone recovered by now. DC and I went back to Redang to look up some friends for diving. We were there just as the coral bleaching broke out and were incredibly sad at the poor state of the coral. Global warming had taken its toll and the seas were unseasonably warm this time of the year. To upside was only for me as it was warm enough that I didn’t need to wear a wetsuit, the wuss that I am. Our first dive was a bit of a shock. Whole patches of the coral had gone ghostly white and the patches stretched far and wide across the coralscape as far as the viz allowed us to see. 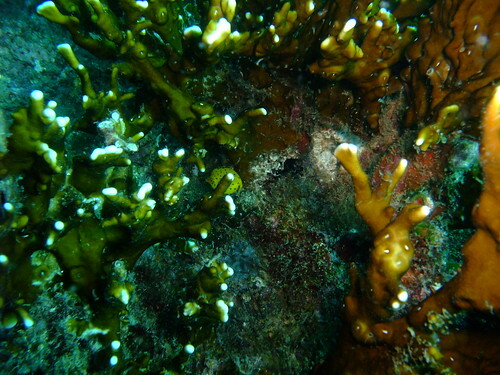 It didn’t help that the water was a bit murky and the usually brightly coloured coral was completely washed out. 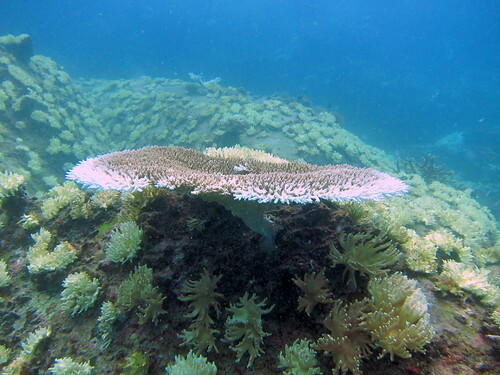 A lot of the hard coral was affected,, including the staghorn that was bleached from its usual tan to sickly yellow to dead white. It was an incredibly sad sight. At some places, it wasn’t too bad, but we could already see the bleaching taking its toll on the outer edges. It was so depressing that the yellow sunflower coral that the other divers liked so much did nothing for me, looking to me as if they were pus-filled fungal colonies taking over the reef. 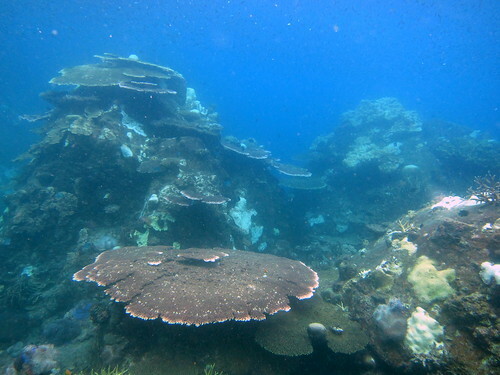 Yet, not all dive sites were affected. Only some areas hit by the worst conditions of warm water and unfavourable currents suffered badly. 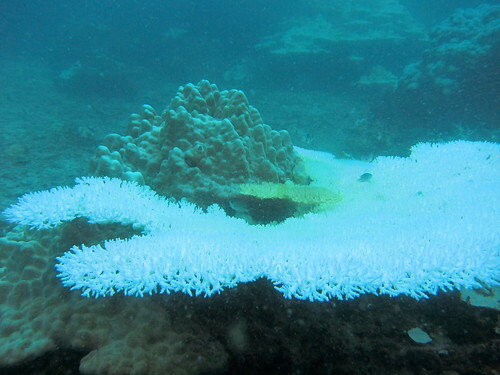 On other reefs, it seemed like life went on as normal, with only minimal bleaching that was hardly noticeable. 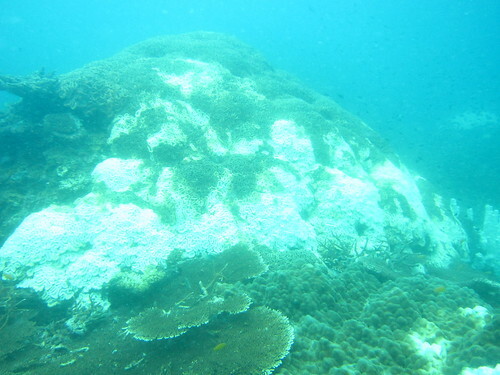 At some areas, I pretty much forgot that the bleaching situation was really bad – there was so much coral and fish life. But the diving wasn’t always great. 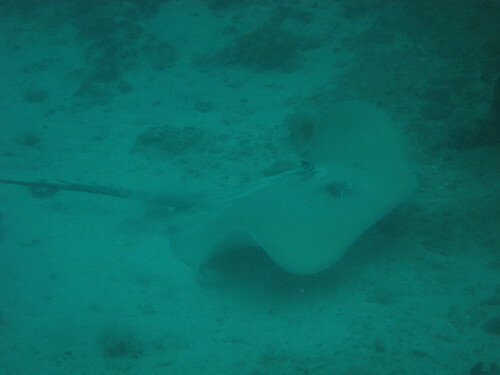 Somehow we ran into a lot of poor visibility, especially in the sandy areas where we saw this blue spotted stingray. 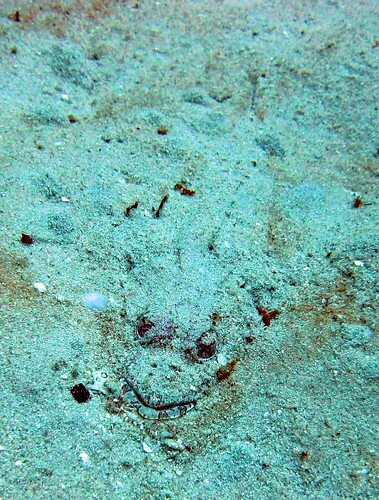 And this crocodile flathead, also in the sand. 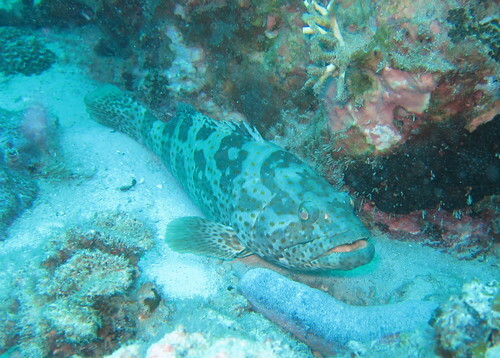 Things got a little better on the coral itself where there were bigger fish like this grouper. 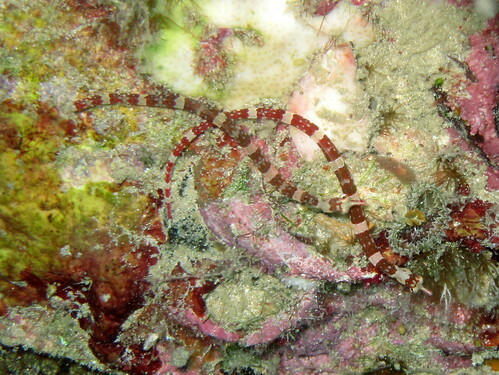 And on the coral were the pretty brown-banded pipefish that came in pairs, skittering over the reef with cautious movements. The soft coral didn’t seem to be very much affected. 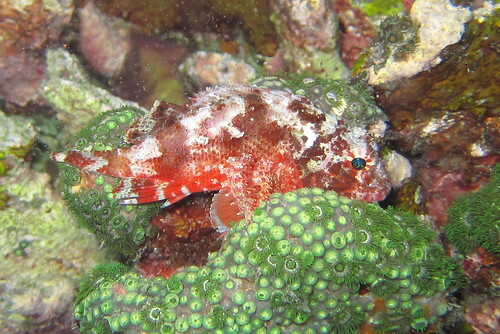 It was healthy enough that this lionfish took refuge in it, peering placidly out from its sloe-eyes. So all wasn’t quite lost as the reef didn’t seem to be all that dead. It appeared to be rebounding despite the dead patches. We were cheered as we continued our diving. 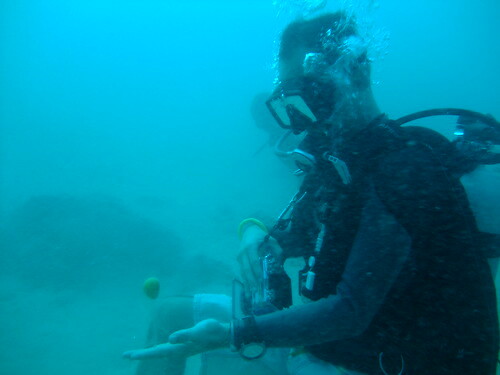 For our last dive, Tim took us to a coral bommy sticking out in the middle of the sea. He told us that it had very nice soft and colourful coral that couldn’t be found anywhere else in the other Redang dive sites. 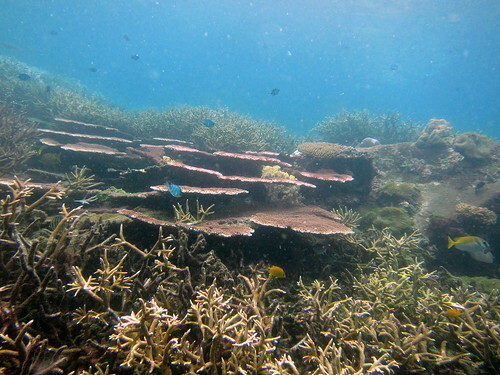 We exited the boat and dived down to the coral bommy. 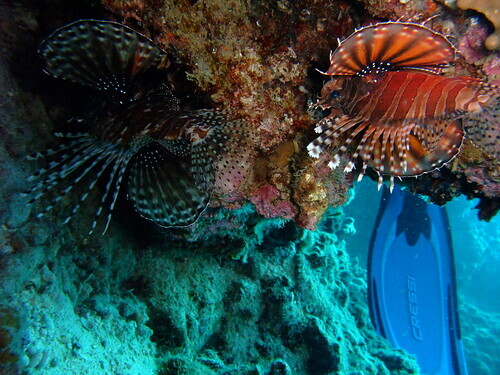 We immediately found a very pretty pair of lionfish down there. 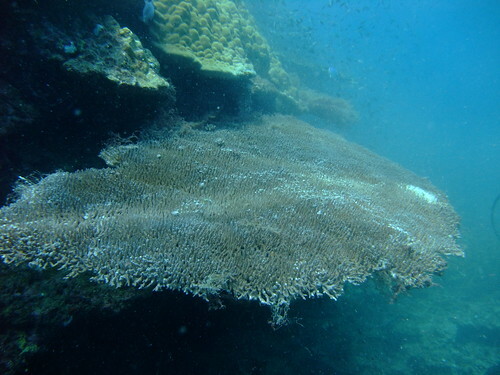 However, we were also dismayed to find a large stray net had draped itself over the beautiful table coral! 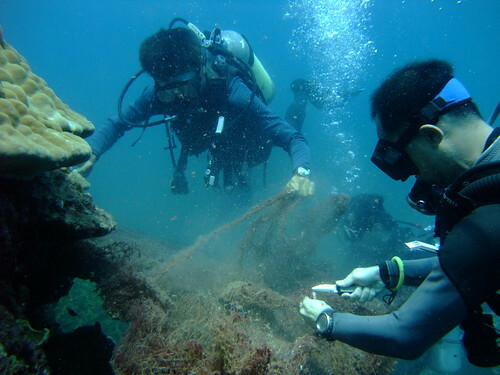 Immediately we swung into action, tearing away the net and trying not to damage the coral in doing so. It was really cool how everyone was willing to forgo their dive and carry out a clean-up operation without any prompting. No words needed to be said here – it’s the duty of every diver to do their best to clean up the dive environment, and stray nets are some of the worst bits of trash left by humans in the sea. 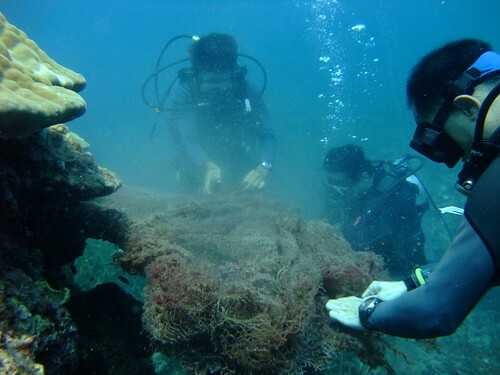 Left unattended, such nets will kill the coral, trap fish and other sea creatures and even entangle unsuspecting divers. Disposing of the net was the only decent thing to do. Tearing off a net’s pretty hard though, especially without gloves. Due to the encrustation, the net can be embedded with sharp objects that will tear at the skin if you’re not careful. After a while, we also had to get the knife out to remove some of the more stubborn bits of netting. 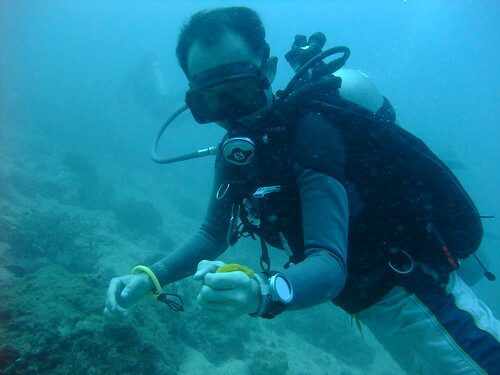 We worked for many minutes to clear the net, but eventually the table coral was finally free of the man-made menace. It was with a great deal of satisfaction that I ended my final dive in Redang. I’d accomplished something good that day. 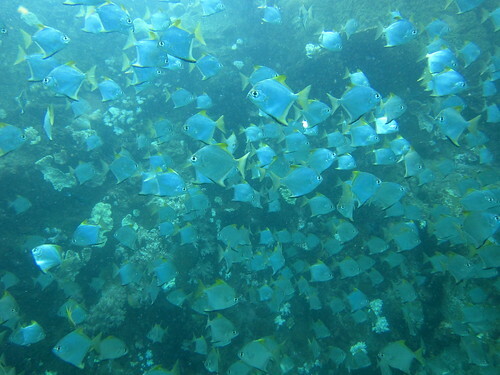 Redang is a great place with some nice dive sites. Well worth a return visit! For my introductory deep dive, Tim decided to make things a bit more interesting and took down a raw egg to show the effects of water pressure. On the surface, air pressure = 1 atm (atmospheres). For every 10 metres depth, the effect of the water pressing down on us increases by another 1 atm, so at 30 metres depth the pressure is 4 atm. What this means is that an egg, cracked at a deep enough depth, will retain its round yolky shape in the water. Like so. It was quite an interesting science lesson, and it was quite fun to bat the yolk ball back and forth between us. Unfortunately, we got a bit overenthusiastic and after a while the water pressure was unable to compete against the squishy strength of our hands. The yolk broke and made quite a mess in the water. Lesson over, we got round to some nice diving. One of my favourite photographic subjects are pufferfish. 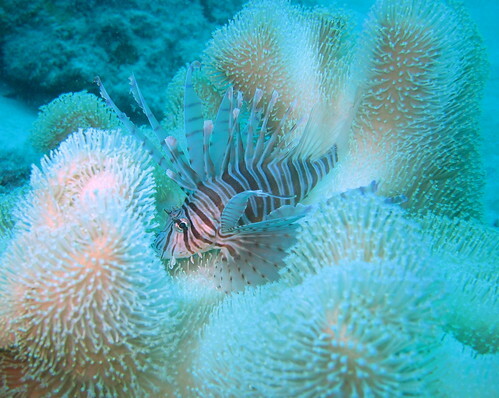 There was a nice specimen hugging the reef that day. 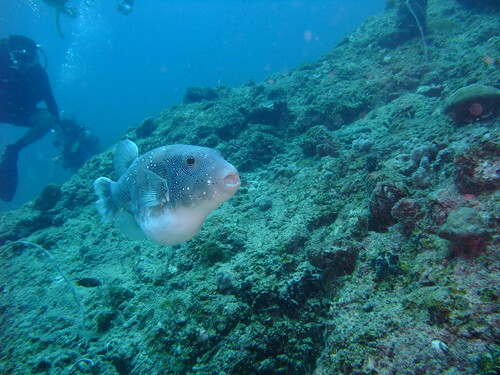 It always cracks me up to see pufferfish. 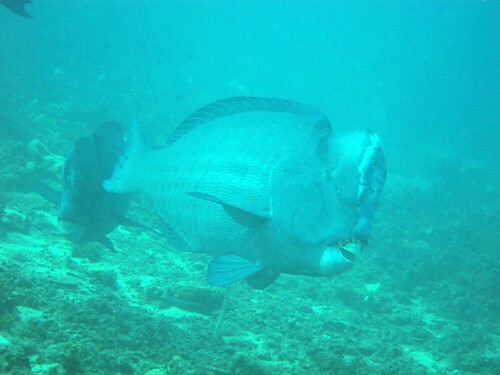 It’s hard to imagine funnier-looking fish. And if you ever imagined a football swimming through the water, that’s how they swim. 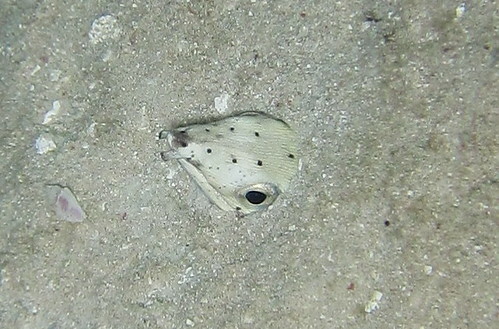 We also came across a juvenile boxfish, which is part of the same family as the pufferfish. 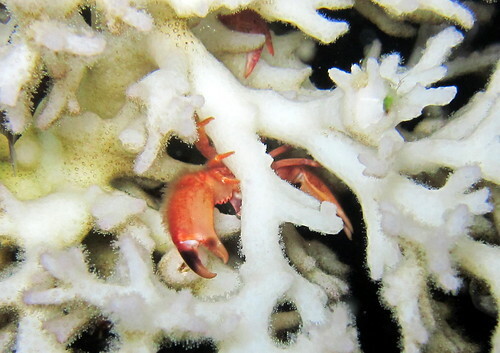 The poor little guy was petrified by us, and did its best to hide in the coral for protection. When he grows up, he isn’t going to be much bigger either! The PADI Advanced Open Water Diver course comprises several specialty dives, but the main reason why people take it is to dive deeper than 18 metres (up to 40 metres for a qualified advanced diver) and to do night dives. I love night dives. Once you get past the spookiness of utter blackness surrounding the nimbus of your torch, you get to enjoy a whole multitude of sealife that you can’t ordinarily see during the daytime, as well as a whole set of different behavioural patterns. Because of the pitch-black nature of the surroundings, camera flashes also fire at maximum efficacy, which makes for very beautiful photos. 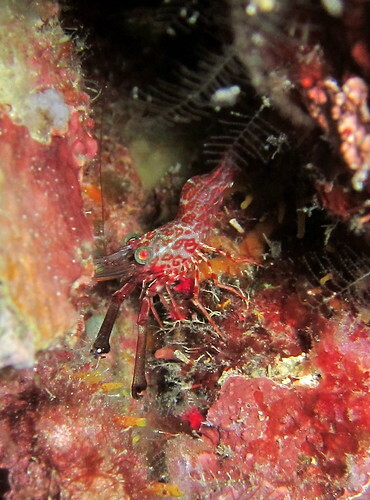 For my first night dive, I certainly wasn’t disappointed. 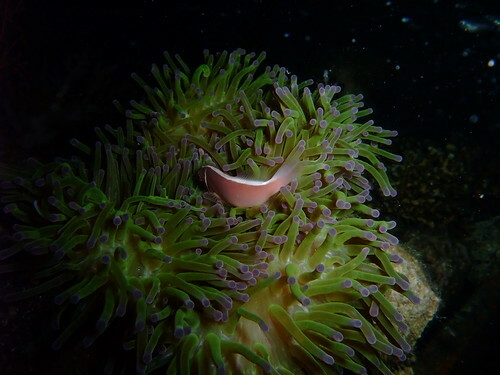 See how the flash brings out the beautiful purple highlights of the anemone? 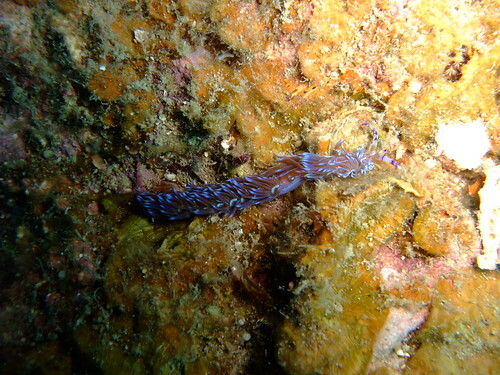 Another example of the vibrant purple can be seen in this picture of a flibonella. 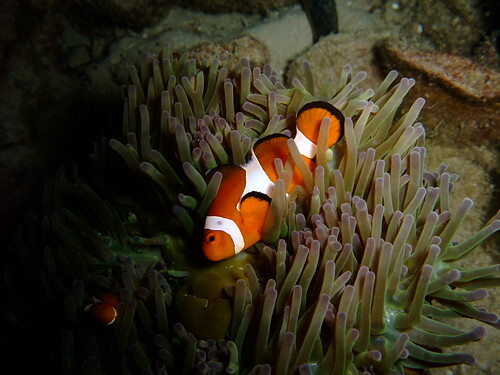 WS also uncovered a cute false clownfish that was outside its protective anemone home. 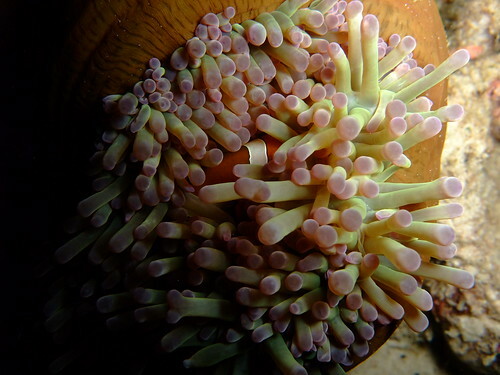 … until it was completely covered by the anemone’s stinging tentacles. 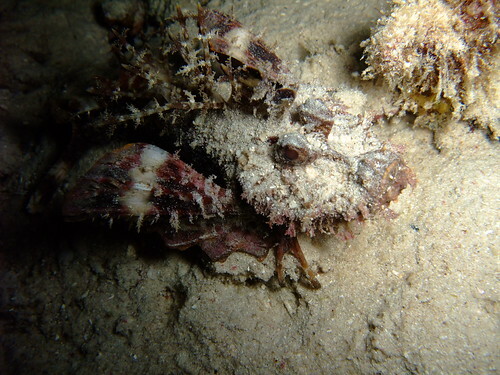 Nighttime also brings out the ambush predators, such as this spiny scorpionfish. The sharp spines on its back contain a poisonous toxin that can really hurt. 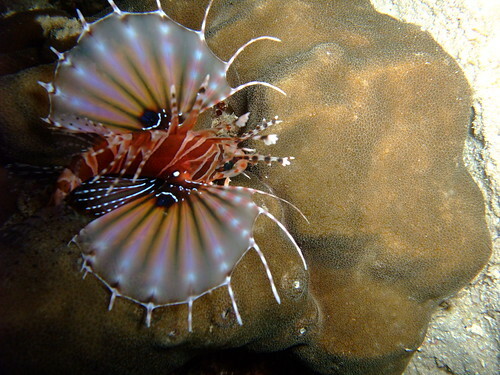 We also saw this beautiful, and aptly-named twinspot lionfish. Overall, this was a great introduction to night diving.